Spread cashews on a cookie sheet. Toast in the oven for 5-7 minutes, stirring once halfway though with a spatula. 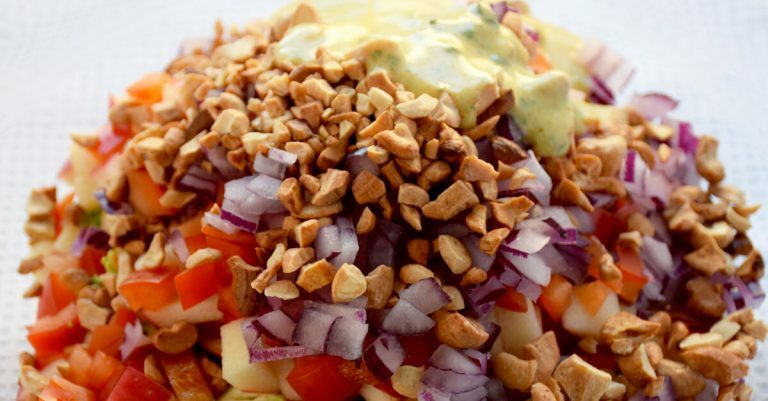 While the cashews are cooling, make Curry Yogurt Dressing. Combine cashews and vegetables in a bowl and toss with the dressing. The recipe provides enough salad for two hungry salad lovers or as 4–6 side salads. This recipe is in your Shopping List. This recipe has been added to your Meal Planner.